Attracting butterflies and hummingbirds to your garden is as easy as planting the flowers they like. Plant enough of their favorites so that they can find them easily and return often. But hummingbirds and butterflies need more than just nectar, like water and shelter. One very important thing to remember about attracting hummingbirds, butterflies or anything that is going to be tasting the plants in your garden is to avoid using pesticides. Here are more tips for what to plant to attract butterflies and hummingbirds and how to keep them happy, healthy and returning to your yard. If you have enough nectar-rich plants in your gardens, butterflies will find it. But to attract and keep butterflies in your garden, you have to be willing to feed their offspring. That means putting up with some destruction from feeding caterpillars, such as black swallowtail caterpillars feasting on your dill and parsley and maybe even planting some weedy milkweed, to attract monarch. If you can deal with this, then you can make butterflies at home in your garden with puddles for drinking and cooling off, logs for shelter, host plants for laying eggs and, of course, flowers for nectar. Once you have a hospitable environment for butterflies, keep them coming back by providing their favorite plants. 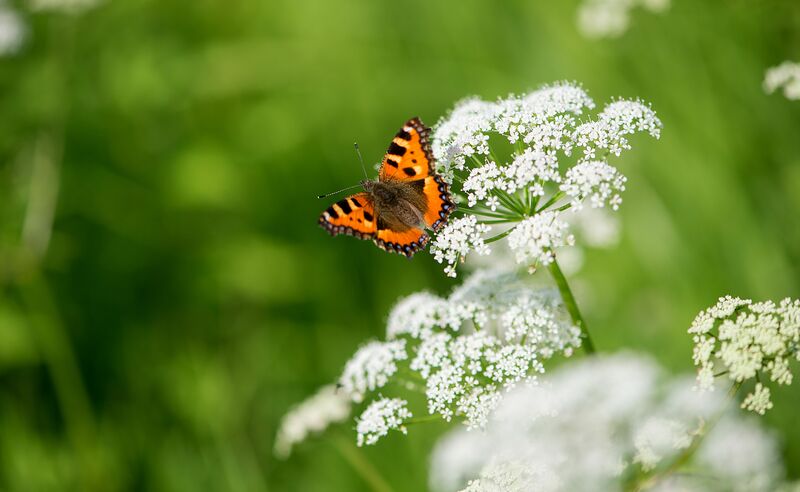 Butterflies are partial to flowers with flat umbels, where they can stop and warm their wings as well as grab a snack on the fly. Bright colors will catch their eye in flight, so consider planting your butterfly plants in swaths larger enough for them to spot. A butterfly plant here and there is not going to do the trick. Remember never to use pesticides on your plants, if you are encouraging butterflies to visit. And keep them in flower longer by regularly deadheading the spent blossoms so that new ones will form. There are several species of hummingbirds, and they each have their plant preferences, but all hummingbirds need nectar-rich plants. Because of their long proboscis, they gravitate toward tubular-shaped flowers. They also have a preference for red flowers, although they will visit flowers of all colors. We often forget that birds need access to water, as much as they need food. Hummingbirds particularly like a gentle mist from a fountain or waterfall. Placing one or two near your plants is sure to attract them to your garden. It takes a lot of energy to move as fast a hummingbirds do, so they are always hungry. As with butterflies, hummingbirds especially appreciate large clusters of their favorite plants so that they can flit from one to another. Try to fill your border with a mixture of plant heights, since some species of hummingbirds prefer to graze lower than others. As mentioned above, hummingbirds love tubular flowers that are rich in nectar. Are you looking for a simple design to build your butterfly garden? This half-circle border of plants should have butterflies and even a few hummingbirds fluttering through it by mid-season. You can use the plan as is or tweak it with your favorite plants. Many favorite butterfly plants are herbs. Dill, parsley, and fennel all have those wonderful flat, umbel landing pads butterflies love, as well as plenty of nectar. You can include them in a designated herb garden or incorporate these herbs into any border. However, keep in mind that the caterpillars of many popular butterflies will also feed on your herb plants. Try not to panic; the caterpillars will quickly turn into butterflies, and your herbs will regrow.